Valentine’s Day can cause a lot of stress — from the pressure to impress your sweetheart to the aftermath of Christmas credit card debt. With careful planning, you can however make Valentine’s Day wonderful on a shoestring budget. Need ideas?… Start with the following 5 fun things you can do for your special Valentine all day long. #1 Wake up your Valentine with a gift and a kiss. The gift does not have to be anything expensive or elaborate, just a taste of what is to come later in the day. Candy or a teddy bear will do just fine. 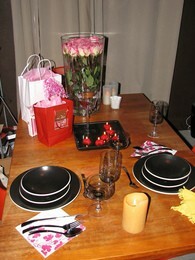 #2 Take your sweetheart out to breakfast. Breakfast is the least expensive meal to have in a restaurant. You can have a meal for two at IHOP for just $20 with tip. How can you go wrong with that? If one or both of you don’t have time to enjoy breakfast, make a quick stop at Starbucks or even McDonald’s for some coffee and a Danish or breakfast sandwich. #3 Bring balloons to work. You can pick up balloons at the dollar store and drop them off at your sweetheart’s work. Taking a half hour or so do make this symbolic gesture will have them looking forward to a romantic evening. You can even include a cryptic note with suggestions for the evening’s activities. #4 Consider a Valentine’s Day lunch with your sweetheart — especially if the morning was too busy for anything more than a phone call. Go for a quick trip to the local Chinese restaurant and share an entre for an inexpensive, tasty and romantic lunch. If you opt to go to a restaurant for Valentine’s Day, here’s how to have a fine dining experience on a budget. These ideas can take you through a whole day together. Or, you could choose just a portion of the day to enjoy together without breaking the bank.